AGV Corsa Helmet: Corsa? I Barely Know Ya! Err wait, this is still an inanimate object, sorry about that. I was mesmerized by the pure beauty and elegance that the new Corsa delivers. 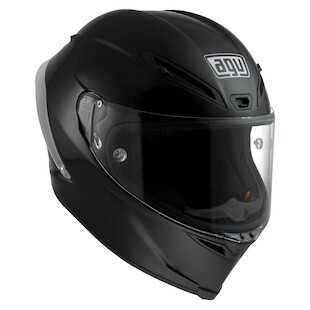 AGV’s Corsa, the long awaited road going version of the pinnacle Pista GP. From a functioning standpoint, the AGV Corsa is in the top of its class. An outer shell is comprised of composite fiber, aramid, and carbon fiber - the lightest full face I have yet to hold (excluding the Pista GP). I would say that the Corsa is worth its weight in gold, but unfortunately it is so light that saying does it no justice! Unlike the Pista GP, The Corsa comes standard with adjustable ventilation and a pinlock shield. Don’t worry though, the outer shell shape, aerodynamics, tear off posts, and massive eye port are unchanged from the Corsa’s bigger brother. I could go on forever about the bellissimo Corsa, praising it left and right for the innovation and high quality combined into a single helmet, but I will spare you the time. What you need to know in the end of the day is for a race ready, street friendly, unbelievably light helmet, the Corsa will undoubtedly be your best bet (as long as you can wait until the winter! ).